Africa, a land of incursion, of expeditions, of raids and of civil wars. Africa where the evils of our civilization seem engraved, set up as in an image negative of our era. On this troubled land are born and live vivacious Africans, always rising. African humanity, vital, essential force. Why then these gaping wounds? What is there to do to surpass them? Answers exist. The exposition hints at some, in a clear minded way devoid of a sense of pity and commiseration, in the same way in a soft as well as strongly and excessive way of viewing the inhabitants of this unique and original continent. 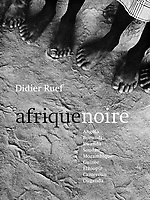 Afrique Noire. Infolio Editions. 22x28 cm, 192 pages. Hard cover. Duplex. 154 black & white pictures. Photography Didier Ruef. Preface Joseph Ki-Zerbo, postface Ali A. Mazrui. Published 2005.